Quinoa with roast sweet potato, onion, fennel, raisins & fresh herbs, topped with hazelnuts. Onion: Peel the onion, then cut into wedges (1½ cm thick), then cut these wedges in half crossways. Roast veggies: Place the sweet potato on one side of a tin foil lined baking tray with a drizzle of olive oil. Season with salt and pepper, sprinkle with cinnamon and dried rosemary, then mix and arrange in a single layer. Place the onion and fennel bulbs on the other side of the tray with a drizzle of olive oil and salt and pepper. Mix and arrange in a single layer. Roast or 30-35 minutes until golden. Hazelnuts: Toast the hazelnuts in the oven for 5 minutes until golden. Remove and set aside to cool down, then chop them roughly. Rainbow quinoa: Place a pot on medium-high heat and add the quinoa with boiling water (3 cups for 4; 1½ cups for 2) and a pinch of salt. Bring to the boil and cover, turn down the heat and simmer (gently boil) for 15 minutes, until all the water is absorbed. Set aside to cool down, then add the lemon zest and mix through. Roast veg & quinoa: Add the roast veggies to the quinoa with the raisins and mix through. Drizzle with olive oil and add lemon juice to taste. Season with salt and pepper. 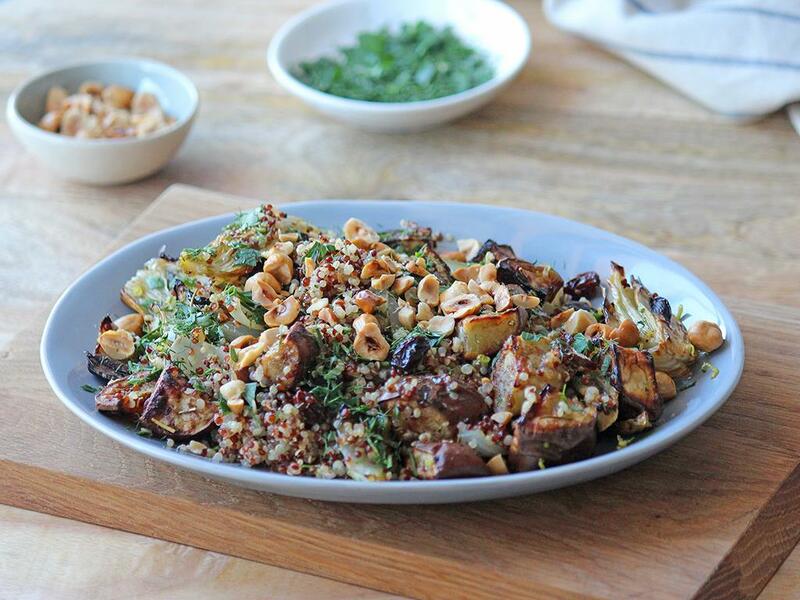 Serve by mixing the fennel fronds and parsley through the quinoa and top with the hazelnuts. "Was it easy to prepare? Yes Was there enough food? Yes Were the instructions easy to follow? Yes Very tasty with subtle flavours. Took it with to a supper as my contribution. " "Fantastic dish and made more than enough! My only recommendation would be perhaps cutting the butternut a bit as that was a bit of extra effort on my end, but otherwise great!"